Looking to help out retailers when times get busy, like back-to-school and the holidays? A tailored resume can help you get noticed. 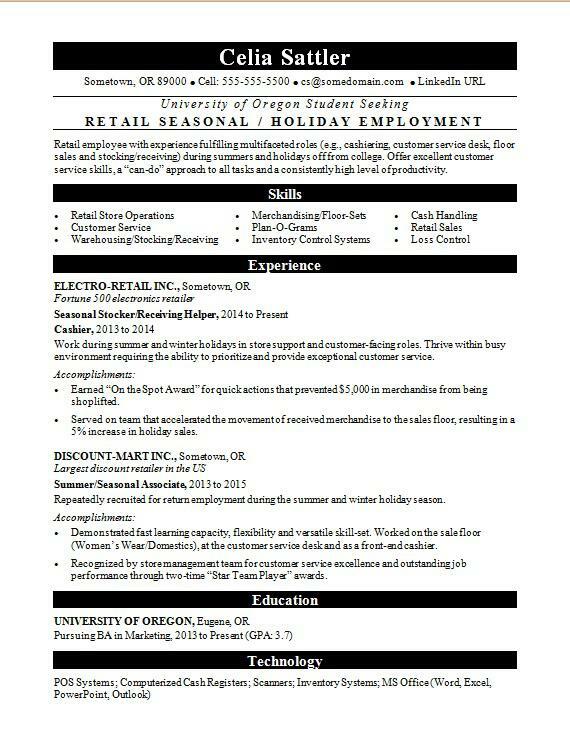 For inspiration, view the sample resume below and download the seasonal retail worker resume template in Word. And if you need more help, get a free resume evaluation from the experts at Monster's Resume Writing Service. Additionally, you can learn more about retail careers and customer service careers, and search for seasonal retail jobs on Monster. Retail employee with experience fulfilling multifaceted roles (e.g., cashiering, customer service desk, floor sales and stocking/receiving) during summers and holidays off from college. Offer excellent customer service skills, a “can-do” approach to all tasks and a consistently high level of productivity. Work during summer and winter holidays in store support and customer-facing roles. Thrive within busy environment requiring the ability to prioritize and provide exceptional customer service. Earned “On the Spot Award” for quick actions that prevented $5,000 in merchandise from being shoplifted. Served on team that accelerated the movement of received merchandise to the sales floor, resulting in a 5% increase in holiday sales. Repeatedly recruited for return employment during the summer and winter holiday season. Demonstrated fast learning capacity, flexibility and versatile skill-set. Worked on the sale floor (Women’s Wear/Domestics), at the customer service desk and as a front-end cashier. Recognized by store management team for customer service excellence and outstanding job performance through two-time “Star Team Player” awards.